Albert Abraham Fellert (1890 - 1943) worked at Richtstraße 49 (today Karl-Marx-Str.). He was a member of the German Communist Party (KPD) from 1925, single and childless. He had as his business a shop for men's clothing, which he was forced to sell in 1939. After his short imprisonment in Sachsenhausen Concentration Camp following the 1938 pogrom night, he applied for and was given his remaining credit of 433.80 reichsmark from a frozen account. He wanted to fund his emigration with this. 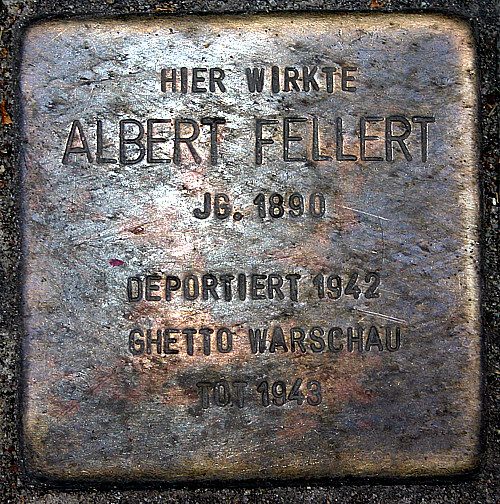 In 1942 Albert Fellert was arrested again and deported to the Warsaw Ghetto, where he died at the age of 53. Moses Mamroth (1880 - ?) came from Chelmce bei Hohensalza (Inowroc?aw/Poland) and lived from 1922 in a sub-let at Richtstraße 37. He was deported to the Warsaw Ghetto on 02.04.1942. Hedwig Luft, née Heymann (1879 - ?) was born in Stolp (Pommerania). She was the proprietor of the shop "Luft & Rosenow, Manufakturwaren" at Theaterstraße 6. She was widowed and lived from 1941 at Wollenweberstraße 60 (the "Jews' House"). There she shared a room with five other people. In 2007 Stumbling Stones were laid at Karl-Marx-Straße 10 in memory of her daughter Else, Else's husband Kurt Fellert, and Hedwig's two grandchildren, Rita and Lothar Fellert. Hedwig Luft was deported to the Warsaw Ghetto in 1942. Three months later, the Finance President of Brandenburg in Berlin sold her furniture and other personal possessions. Her son Günter lived in Zepernick and Berlin, and emigrated to France. From there he was deported to the extermination camp at Auschwitz in 1942.